I'm picking the bike up tomorrow from Joe. I'm still not convinced it's 100% finished, but he tells me it is. So I suppose we'll see! I'll get some extended miles on it next week and report back to him. Joe mentioned last time we spoke that he put in an order for more connectors, so hopefully that means he'll have a few more units that can be ready for shipping soon. I'll call them tomorrow, they're answering the phone today. Could you please post some pictures of the system and controls? It's a waterproof trailtech 3-button unit. Here's something to excite you guys. I just got the bike back on Saturday and the cruise works great. I made a couple suggestions to Joe on things he can make better. Once I get a production wiring harness I will be doing a full write-up and install procedure for you guys. Last edited by monocog007; September 26th, 2016 at 05:01 AM. So, how is it working out? I called and was told that they are on back-order... I will order mine when they are available and we have some real world feedback. I have about 300 miles on the cruise so far. Wow, I can't imagine how I ever rode this thing without it. The buttons and layout are awesome, and it's very intuitive to use. The middle button is on/off, Top button is for setting and accelerating, bottom is for decelerating. Also the install process is super simple. Route all of the cables from under the seat along the right side to follow the hard brake lines and clutch cable, up to the steering stem area. 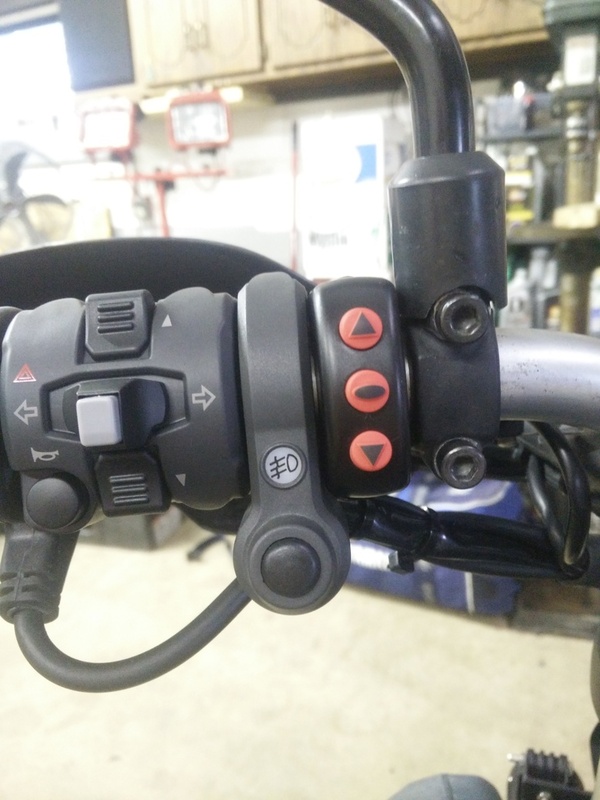 This is where it plugs into the throttle connector, and the other wires run behind the headlight for the status LED and the controls. Should be easily completed in under an hour I'd say. The unit comes pretuned for all of the cruise control algorithm parameters, but comes with instructions on how to change these parameters if necessary. I haven't found that it's needed yet, as the cruise holds around 1mph of what I set it at. Either brake or the clutch turns the cruise off, that's obviously needed for safety. I forgot to mention, the control box itself sits underneath the seat on top of the ECU. I can get a photo for you guys tonight. I keep a larger toolkit in my trunk, so the small tool pack under the seat can be taken out. It's sad Ducati doesn't leave room for very much under there.